Everyone knew Su Yi’s personality. People had never gotten the better of him since young. He San, Song Wu Qiu and the rest of the people from his generation, which one of them had never been bullied by him since young? 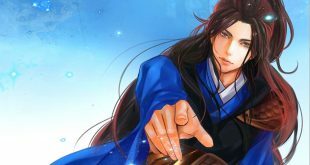 Though this Ji Chao may have come from Sacred Mountain and he may be far stronger, but when talking about who gets the better of whom, everyone in the city knew in their hearts that this fellow Su Yi had never lost in a mockery battle. Hearing Su Yi’s words, Ji Chao’s mocking face instantly turned into ugly as he stared coldly at Su Yi. Looking at Ji Chao, Su Yi’s eyes were very calm, but his body became straighter. That icy voice rippled outwards through the entire plaza, turning the atmosphere colder. Finishing his words, Yuan Qi burst out from beneath his feet. With a stomp, he shot towards Su Yi, light black Yuan Qi gushed out from his palm. In a flash, Ji Chao raised his right arm and curved it slightly, black Yuan Qi moved around his fingers, converging at his fingertips. With a screech from the air tearing, his arm went for a clutch on Su Yi’s neck sharply. Hearing that screech of air tearing apart, Su Yi’s eyes slightly squinted. A flash of light burst from his feet at the same time. With one foot slightly stepping in front, the Yuan Qi on the soles of his feet turned into a force of repulsion and instantly his body shot backward. Seeing Su Yi’s action, though this could be said as a retreat, there were quite a few people present who had keen eyesight and what could be seen as Su Yi retreating easily was actually reflexes which were fast beyond comparison. This level of swift reaction was not at all normal. Ji Chao face fell. He had never thought that Su Yi would react so fast. His body which lunged out landed on the ground. He turned his hand which was in the form of an eagle’s claw into a palm. The black colored Earth attribute Yuan Qi surged out even more violently. Bloodlust gushed out from his eyes as Yuan Qi gathered in his palm as if there was a layer of black light on it. Some youths from Sacred Mountain were surprised. Ji Chao actually used the “Earth Palm”. Coldly staring at everything, Wang Quan De sneered. Looks like this is the end. With the blow from “Earth Palm”, even if that brat Su Yi is not dead, he would be crippled. The palm followed with the sound of air roaring as turbulent winds swept the dust and broken stones present all into the air. Now, Su Yi had already lost his repulsion force and his figure came to a halt. Feeling the powerful winds, his face gradually became serious. Everything was happening as fast as lightning. There was no time for hesitation. The palm had already arrived in front of him. Su Yi raised his arm and Yuan Qi formed in front of his palm. Seeing Su Yi’s action, the upper ranks of the families and the spectators present were all in an uproar. No matter from which perspective, if he was going to meet it head on, Su Yi would be at a disadvantage. This was not a smart decision. Ji Chao sneered. Wanting to meet it head on, this kid is courting death. When everyone was holding their breath in anticipation, that palm had almost arrived in front of Su Yi’s chest. Su Yi’s eyebrows rose. In a blink of an eye, his feet stepped against the side, his body dodging in the other direction. Ji Chao grinned. How could this kid still be able to dodge? His palm just had to shake once and it would already hit him. Su Yi dodged the blow on his chest, but Ji Chao’s attack landed ruthlessly on his left shoulder. A low and muffled explosion was heard. In that instance, everyone’s face changed. Their hearts were in their mouths. In the end, Su Yi was not an opponent for Ji Chao. But it was also in that instance, the corners of Su Yi’s mouth curved to form a cold grin. With a stroke of ruthlessness, his body let the gigantic impact on his left shoulder to turn to the right. At the same time, a cold light flashed from within Su Yi’s sleeve. He threw his right arm out and with a speed faster than sound. The light flashed across Ji Chao’s face. As the palm print landed on his shoulder, a mouthful of fresh blood sprayed out from Su Yi’s mouth. His body blown back. Only after staggering for around 7-8 steps did he manage to stabilize himself. Simultaneously, on Ji Chao’s left face, an injury a whole finger-long extended downward from the corner of his eye. Fresh blood gradually seeped out, staining his entire left face. The intense pain forced Ji Chao to grab his face and cry in pain. Initially, everyone thought that Su Yi would lose, but who would have thought that it would end like this. It was at this moment that everyone understood. Su Yi was not trying to meet him head-on, instead, he was trying to draw Ji Chao’s attention and make an underhanded move in the end. Seeing Ji Chao’s blood-stained face, everyone looked at Su Yi. In his right hand was a blood-stained dagger, light reflecting off it. It was obvious that Su Yi suddenly used his dagger and it was from out of nowhere. With the method of both sides being injured, he had also hurt Ji Chao. The faces of the few youths from Sacred Mountain changed greatly. They had never thought of this ending. Su Yi’s words rippled outwards crisp and clear. The gazes of everyone turned into those filled with astonishment as they looked at the young man who still had blood on the corner of his mouth. The young lady from Sacred Mountain who was around 15-16 years old, seemed not to care much about Ji Chao being injured. Instead, she seemed to have found an interest in Su Yi. Wang Quan De recovered from his daze. His face changing immensely. He never thought Su Yi would make such an underhanded move. Old Master Su Yun Tian spoke. There was finally movement in his eyes. Seeing the blown-back Su Yi, his eyes were filled with happiness and shock. A voice filled with hate came out from Ji Chao’s mouth. His blood-stained face looked savage and his eyes were brimming with bloodlust as he stared at Su Yi. As he finished his words, black Yuan Qi gushed out of his body like fog. The aura on him also burst out without restraints. “Peak of Yuan Soul Realm, almost entering the Yuan Xuan Realm!” When the aura on Ji Chao’s body burst out without restraints, feeling such a powerful presence, the upper ranks of the big families were all shocked and could not help exclaiming aloud.